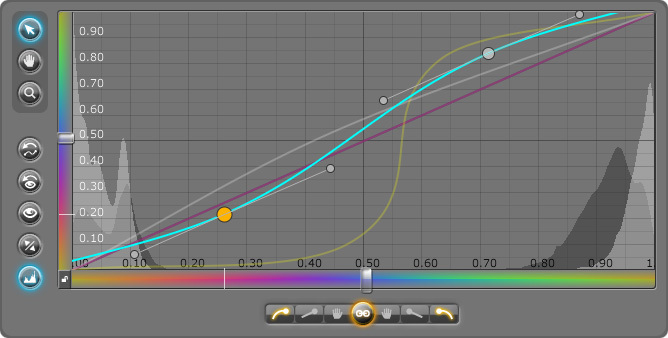 Curves are a very versatile and precise color correction tool. The native After Effects version lacks control and accuracy to take full advantage of it. Fresh Curves makes up for these drawbacks so you can get the most out of this basic tool. Using invert you can work in your own color space. Apply your custom "gamma curve", do the work and apply and the inverted one. Need to be precise? Just edit or sample your values. And change the color range to what you are comfortable with. "Fresh Curves is hands down the best color correction tool in our arsenal. We have been waiting for a precise curves tool for a long time!" Paul Graff - Visual Effects Supervisor. Emmy winner 2008 for John Adams.